We proffer our customers a precisely designed array of Leather Tool Bags which is spacious, highly durable, crack resistant and resistant to wear & tear. Made using premium quality leather, these bags are designed in line with the International standards. Size: 23" x 8" x 6"
Color: Off white printed on offset. Specifications Size: 17" x 12" + 6"
Specifications: part no: 93-223. 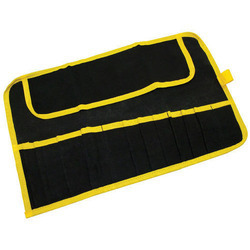 Type: nylon tool bag water proof. Size: 230 x 300 x 300 mm. 17.5X9.5X6.5 Made of heavy duty cotton canvas, giant main compartment with 12 toll pockets , heavy duty nylon zipper , 2 snap button closed outside compartments , hard bottom with grab handles. We are engaged in offering Tool Kit for Watchmaker , which is made from the best quality leather making them endurable and long lasting in nature. This tool kit includes several specialized tools, that is used by our expert watchmaker for general repairing of watches. this products made by Buff Suede leather it is Tools folder bag with 12 pockets with naylon starp. 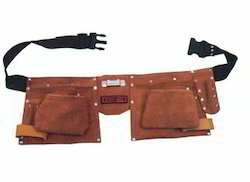 9 Pocket split leather carpenter dry wall bag. - 3 pocket design includes , one large main pocket , one front pocket , one belt level inner pocket plus six small tool pockets. - two leather hammer loops. - double stitched & rivet reinforced. - wide belt tunnel slot. Our range of canvas tool bags has gained lots of appreciation for their excellent features. These canvas tool bags have heavy duty canvas and nylon zip with runner. We offer these canvas tool bags in various sizes such as 18", 24", 30" with rope handle. rubberized fabric of excellent breaking strength.